This entry was posted in and tagged Research Seminar on September 27, 2016 by Alice Johnstone. Kristin Hoganson is an acclaimed cultural historian of U.S. empire at the University of Illinois and is currently serving as the Harmsworth Professor at Oxford. Her talk should be of interest to anyone interested in empire, U.S. history, or food! This entry was posted in and tagged Anglo-Saxons, Kristin Hoganson, Research Seminar on December 8, 2015 by Alice Johnstone. This entry was posted in and tagged Relics, Research Seminar, Science on November 24, 2015 by Alice Johnstone. This entry was posted in and tagged Global History, Research Seminar, Simon Ditchfield on November 17, 2015 by Alice Johnstone. This entry was posted in and tagged Bert De Munk, cities, Research Seminar on November 3, 2015 by Alice Johnstone. This entry was posted in and tagged Andrew Marsham, Muslim Empire, Research Seminar on October 27, 2015 by Alice Johnstone. This entry was posted in and tagged Research Seminar, WW2 on October 20, 2015 by Alice Johnstone. 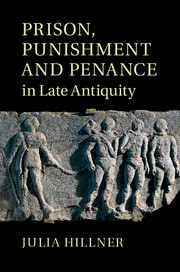 My new book, Prison, Punishment and Penance in Late Antiquity, published in May 2015, tracks the long-term genesis of a late antique legal penalty, forced penance in a monastery. This paper will aim to take listeners through the main arguments of the book, by focussing on a particular aspect of the penalty: its use to address ‘deviant’ female behaviour. It will discuss the treatment of women in late Roman criminal law and the role of the household and the increasingly Christian community in dealing with ‘female’ crime, to understand better why monastic penance was apparently often (but by no means exclusively) imposed on women. This entry was posted in and tagged Julia Hillner, Late Antiquity, Punshiment, Research Seminar on October 13, 2015 by Alice Johnstone. This entry was posted in and tagged American History, American Proslavery, Matt Karp, Research Seminar on October 6, 2015 by Alice Johnstone. Our first Department Seminar of the academic year! This entry was posted in and tagged 20th Century Europe, Ian Kershaw, Research Seminar, Writing History on September 29, 2015 by Alice Johnstone.